Massachusetts Gov. 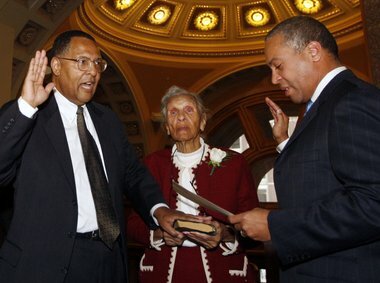 Deval L. Patrick, right, re-enacts the swearing in of Roderick Ireland, left, as Ireland's mother Helen Ireland holds the Bible, Monday, in Boston. Ireland was sworn in as the first black chief justice of The Massachusetts Supreme Judicial Court.